Sixty-seven year old American jazz guitarist, composer and arranger Bill Frisell was born in Baltimore, but grew up in Denver, Colorado, where his love of music blossomed. Bill Frisell’s love of music is just as strong today, as it’s ever been, and proof of this is his new solo album Music Is which has just been released by Okeh-Sony Music. Music Is showcases one of the most innovative guitarists of his generation,and is very different to his recent albums. This time round, Bill Frisell recorded the album over a five-day period in August 2017, and played everything from acoustic and electric guitar to bass and ukelele while deploying an array of loops and effects. The result was yet another groundbreaking album from a true musical pioneer, who didn’t start out playing the guitar. Initially, the young Bill Frisell studied clarinet with Richard Joiner of the prestigious Denver Symphony Orchestra, and later by Johnny Smith. By then, Bill Frisell had graduated from Denver East High School and enrolled at the University of Northern Colorado where he studied music. By then, Bill Frisell had started to play the guitar, and was lucky enough to be taught first by Dale Bruning, and after he graduated from University of Northern Colorado cool jazz guitarist Johnny Smith. However, soon, Bill Frisell was heading to the Berklee College of Music where he was taught by Jim Hall and Jon Damian. All these years of studying paid off, and Bill Frisell eventually embarked upon a long and successful musical career. Ironically, it was by sheer chance that Bill Frisell got his first break when fellow guitarist Pat Metheny was unable to make the recording session for Paul Motian’s album Psalm. Bill Frisell made his way to the studio and played on the Psalm sessions, and proved to be more than an adequate replacement for Pat Metheny. So much so, that he was offered the job as ECM Records’ in-house guitarist, and when Psalm was released in 1982, this was the start of Bill Frisell’s lengthy association with ECM Records. Two years later, in 1983, Bill Frisell went from sideman to solo artist when he released his debut album In Line, which featured solo recordings and duets with Norwegian bassist Arild Andersen. This was followed by his much-anticipate sophomore album Rambler which was released on ECM Records in 1984 and was the last solo album Bill Frisell released in three years. In December 1984, Bill Frisell and fellow guitarist collaborated on an album of avant-garde jazz, Smash and Scatteration which was released on Minor Music in 1985. However, for his third solo album, Bill Frisell returned home. Bill Frisell’s third solo Lookout For Hope which was released to critical acclaim by ECM Records in 1987. By then, Bill Frisell was living in New York and part of a quartet that featured drummer Joey Baron, bassist Kermit Driscoll on bass, Joey Baron on drums, and cellist Hank Roberts. However, after the departure of Hank Roberts, the quartet became a trio and continued to play together. A year after moving to Seattle, Bill Frisell released Before We Were Born, which was the first twenty-one albums for the Elektra Nonesuch label which became his musical home. Before We Were Born, was a showcase for Bill Frisell’s versatility and over the next few years, he went from strength to strength. This included on Have A Little Faith which was released in 1992, and was the fourth album that Bill Frisell had recorded for the Elektra Nonesuch label. It’s regarded as one of his most inventive recordings and was another tantalising taste of what Bill Frisell was capable of. Have A Little Faith was the start of a period when Bill Frisell released a string of critically acclaimed albums including 1994s This Land, 1995s The High Sign/One Week: Music For The Films Of Buster Keaton, the 1997 country album Nashville and 1998s Gone, Just Like A Train which was Bill Frisell’s tenth album for the Elektra Nonesuch label. By then, Bill Frisell had disbanded his trio and was working with a number of different musicians, including some up-and-coming musicians. Other times, Bill Frisell the great and good of music onboard, including drummer and percussionist Jim Keltner, guitarist Ry Cooder for the recording of his eleventh album for Elektra Nonesuch Good Dog, Happy Man. Bill Frisell and his band jammed, combining and switching between Americana, country, folk and jazz on album that was released to critical acclaim in 1999. This was the perfect way to end the millennia. As the new millennia dawned, Bill Frisell’s track Under A Golden Sky featured on the soundtrack to the film drama Finding Forrester, which was released in 2000. This was Bill Frisell’s latest dalliance with the world of cinema. In 2003, Bill Frisell embarked upon a new adventure, when he became the musical director of Century of Song which was a series of concerts at the German Ruhrtriennale arts festival. Over the next three years, Bill Frisell invited everyone from Rickie Lee Jones and Suzanne Vega to Loudon Wainwright III, Van Dyke Parks, Arto Lindsay, Chip Taylor and Elvis Costello. Each of these artists performed their favourite songs at the festivals between 2003 and 2005. Meanwhile, back home in America, Bill Frisell’s critically acclaimed 2003 album The Intercontinentals was nominated for a Grammy Award later that year. Sadly, it was a case of so near yet so far. However, two years later in 2005, Bill Frisell’s 2004 album Unspeakable won the Grammy Award for Best Contemporary Jazz Album. This was one of the highlights of his three decade career. Ironically, Bill Frisell’s 2005 album Richter 858 which was an innovative combination of downtown music and improv, was hailed as one of his finest albums since the dawn of the millennia but failed to win any awards. However, four years later, and Bill Frisell’s 2008 album History, Mystery which was the twentieth album he had released for Elektra Nonesuch, was nominated for a 2009 Grammy award for the Best Jazz Instrumental Album, Individual or Group. Alas, it was once again a case of so near, yet so far. Just a year later, in 2010 and Bill Frisell ended his long and successful association with Elektra Nonesuch, and released the trio album Beautiful Dreamers on the Savoy label. The Lee Townsend produced album was an expansive and diverse album where the trio’s music was ethereal, emotive, spartan and melodic as they play with a restraint. This latest album from Bill Frisell’s trio was released to critical acclaim and was the perfect start to a new chapter in his career. The following year, 2011, Bill Frisell released two further albums for Savoy, the critically acclaimed Sign Of Life: Music For 858 Quartet and All We Are Saying. However, after three albums for Savoy, Bill Frisell was on the move again. He released Silent Comedy in February 2013, which was album of solo guitar improvisations that was produced by his old friend John Zorn. It was hailed as a groundbreaking released when it was released on John Zorn’s Tzadik Records. Alas, it was his only released for the label. Next stop for Bill Frisell was the Okeh label, who released Big Sur in June 2013. It featured music that was inspired by the land, sky, sea, and wildlife of the Big Sur which is situated on California’s Central Coast. Big Sur was released to plaudits and praise as was the followup Guitar In The Space Age! 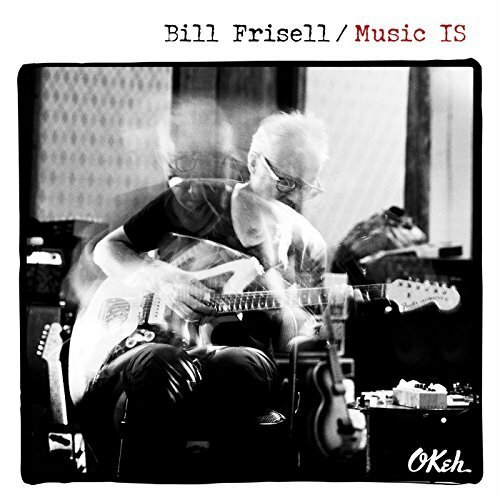 which saw Bill Frisell revisit instrumentals from the eighties on his second album for Okeh which was released in October 2014. Fifteen months later, and Bill Frisell returned with When You Wish Upon A Star, which was an album of family motion picture themes that featured vocalist Petra Haden. She was accompanied by a talented quartet while Lee Townsend When You Wish Upon A Star, which was released in January 2016. Bill Frisell’s first album to feature a vocalist was a resounding success, and many critics wondered what was next for the veteran guitarist? Just over a year later, and Bill Frisell made a welcome return to where it all began for him, ECM Records. They released his live album Small Town which had been recorded at the Village Vanguard, in Greenwich Village, in New York in 2016. That night, Bill Frisell and bassist Thomas Morgan are like a musical yin and yang on Small Town where original compositions and familiar tracks sit side-by-side. Bill Frisell’s return to ECM Records Small Town, was released to critical acclaim. It seemed that Bill Frisell could do no wrong. Buoyed by the success of Small Town, Bill Frisell entered Flora Recording and Playback in Portland, Oregon, on the ‘23rd’ of August 2017. This time, he was about to become a one man band. Bill Frisell setup his acoustic and electric guitars plus his bass, a ukelele and some of his music boxes and an array of pedals. The final piece of the jigsaw were the loops that would augment him on his fifteen compositions that he planned to record. Over the next five days, Bill Frisell recorded fifteen tracks and the alternate take of Rambler. By the ‘27th’ of August 2017 Bill Frisell had recorded Music Is, which was produced by Lee Townsend and was recorded and mixed by Tucker Martine. All that remained was for Greg Calbi at Sterling Sound, in New York to master Music Is. Then Bill Frisell who was one of the most prolific and innovative jazz guitarists could release Music Is, which showed another side to his music. Music Is offers a different approach to a solo guitar album, which Bill Frisell has previous experience of. This included 2000s Ghost Town and 2013s Silent Comedy. However, Music Is finds Bill Frisell heading in a new and different direction which is what critics and music fans have come to expect of this musical pioneer. Just like on Ghost Town, Bill Frisell deploys an array of guitars, plus his bass and his ukelele and makes good use of looping and also layering, while effects prove to be his secret weapon. Whether it is compression, delay or reverse-attack, they’re all deployed by Bill Frisell over the course of fifteen tracks and transform the dry sound as he becomes a one man band. Music Is opens with Pretty Stars where Bill Frisell reaches for his electric guitar which produces crystalline notes that are looped and become part of a carefully crafted multilayered soundscape. Winslow Homer is then reinvented by Bill Frisell, but in many ways stays true to the version that featured on Beautiful Dreamers in 2010. It gives way to Change In The Air where Bill Frisell plays slowly before washes of shimmering guitar resonate and produce a beautiful, dreamy and sometimes haunting soundscape. Wistful, melancholy and ethereal describes the poignant What Do You Want? It’s followed Thankful which is an emotive roller coaster that veers between rueful to hopeful and joyous as this beautiful multilayered cinematic sound unfolds. Although Ron Carter which featured on Blues Dream is slow and broody, there’s a beauty that is omnipresent as musical master craftsman Bill Frisell deliberately introduces and sometimes spontaneously adds parts at the perfect moment, and in doing reinvents this familiar track. Very different is Think About It which is a rocky sounding track that shows another side to musical chameleon Bill Frisell. By comparison, In Line has a much more experimental sound as he deploys effects and tames the tiger that is howling feedback. Bill Frisell included two versions of Rambler on Music Is, allowing for the listener to compare and contrast. The first version features some masterful guitar playing and beeps and squeaks punctuate the arrangement and add the finishing touch as Bill Frisell channels the spirit of Wes Montgomery. By comparison, the alternate version of Rambler which is a bonus track, features a much more understated sound. There’s a poignancy to The Pioneers which sounds as if it’s been influenced and inspired by traditional folk music. This poignant sound returns in Monica Jane, where there’s also a sense of melancholy. Meanwhile, Bill Frisell uses his array of effects and panning is used effectively and reverb ensures that the guitar shimmers. Miss You is a cinematic sounding track that is full of sadness and regret. Very different is the carefree and bluesy sounding Go Happy Lucky which gives way to the rocky Kentucky Derby Bill Frisell showcases his considerable skills as guitarist. Music Is closes with Made To Shine a slow, understated track where fittingly Bill Frisell’s guitar is allowed to shine before he takes his bow. After sixteen tracks including the alternate version of Rambler, which is a bonus track, Music Is draws to a close. Stylistically, Music Is which features just Bill Frisell, follows in the footsteps of 2000s Ghost Town and 2013s Silent Comedy. However, the sixty-seven year old guitarist, composer and arranger latest album Music Is surpasses the quality of both these albums. It’s a remarkable reminder of what one multitalented musician is capable of. Bill Frisell whose recorded over forty solo albums, countless collaborations and worked as sideman on numerous occasions is a musical chameleon who continues to reinvent not just his music, but familiar tracks. That was the case on 2014s Guitar In The Space Age! and 2015s When You Wish Upon A Star. Now two becomes three with Music Is where Bill Frisell dips into his back-catalogue and reinvents fifteen of his own compositions. Often he stays true to the original framework, but other times, takes the tracks in a new direction. Remarkably, Bill Frisell took only five days to record Music Is where the veteran jazz man incorporates elements of America, avant-garde, blues, folk, improv, post rock and rock into the sixteen tracks. Some of these tracks feature complex, multilayered arrangements while others are spartan and underrated. However, all of the tracks on Music Is of the highest quality and showcase a virtuoso guitarist whose one of the most innovative guitarists of his generation.